I felt fatigued for a week leading up a Friday, when I woke up with 102 fever. I stayed home but Saturday morning, I had 103.5 fever. I went to the hospital and diagnosed with pneumonia based on chest x- ray of left lung; right lung was clear. I was put on 6 days of Levaquin. I stayed home for one week, then went to work for a week, but now have worse fatigue. I had another x-ray and my lungs are clear. I feel really fatigued, and find it difficult to walk without being tired - feel like I will pass out and dizzy. It takes a long time to heal! I have sharp pains and itching inside throughout my ears, gums, neck and lips along with swollen lymph nodes. I first started with a swollen lymph node in my groin which was painless but I also had pain in my abdomen and back plus a feeling of fullness in my stomach. I had blood tests which showed elevated CA125 protein so was referred to a gynecologist who thought I had a pelvic infection so prescribed antibiotics. Tests came back negative for infection so I was referred for ultrasound. This showed the lymph node in my groin had swollen to just over an inch and I have a similar sized mass which they think is another enlarged node just above my belly button. I am losing weight as every time I eat the pain worsens in my abdomen and back and I feel full after a couple of mouthfuls. I have now been referred for an urgent CT scan in the next couple of days so hoping to get answers following this. I have swollen lymph nodes with a swollen thyroid. 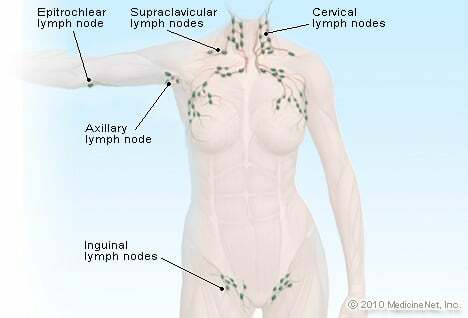 In addition to swelling, the other symptoms of my swollen lymph nodes included cough and throat infection. With swollen lymph nodes I have lengthy cough, a little drainage, aching neck, and pressure above chest area. I get swollen neck lymph nodes and always get a cold sore at same time. I always feel weepy and depressed prior to outbreak. My salivary glands can get so painful that I cannot lay down on my sides. This last week, I had an episode where the swelling was such that if I turned a certain way, the nerve in my ear was impacted and sent shooting pains through my ear. For the past 6 months I have been trying to get my doctor and specialists to find the cause of my swollen lymph nodes. They are large, sometimes tender, painful, difficulty breathing (had to go to the emergency room because I was so swollen I couldn't breathe in April). I am hoarse all the time with a sore throat at times. The swelling is spreading from the front neck nodes to my cervical (hard to tip my head back) to my left groin nodes being swollen which is making my groin hurt and difficult to walk at times. I haven't been rechecked since April although my symptoms recur and I do not have a diagnosis. With swollen lymph nodes, I have pain in knees, elbows, and hands and also tiredness. I have a swollen lymph node behind ear, it feels tender when I turn my head. I had a cold for a week and now it has been about 9 days and turned into a headache, visually showing red mark on my forehead, behind ear pain and clogging, and a swelling hard painful neck lymph node. I have congestion sometimes lung pain right in the middle of lungs. My neck is the worst all just on the right side. I do not have a lot of energy, cold/hot easily and my teeth and gums hurt. For the last six months, I've had aches and pains throughout my body. I have a very high white cell count and have lymph glands the size of golf balls in my neck. Now, during the past month, I've been breaking out in red-dotted sores. I don't know what this could be. Swollen lymph gland in right neck and lump in front of ear and a low grade fever, I have been treated with Clindamycin for 4 days without any change. There is no indication of the cause as yet. It's waiting and sees.